Jean Jacques David dit Saint Michel, 3rd son and 5th child of Jean Pierre David and Marie Magdelaine Monmellian was born on 19 June 1724 at Louisbourg and baptized on that same day. His godparents were Jacques Badeau, captain of the ship, and Marie Magdelaine's sister, Genevieve Monmellian. Fre Claude Sanquer, Superior Cure and Vicar General precided at the baptism. Witnesses attending Jean Jacques' baptism were Francois La Cher and Louis Le Page. 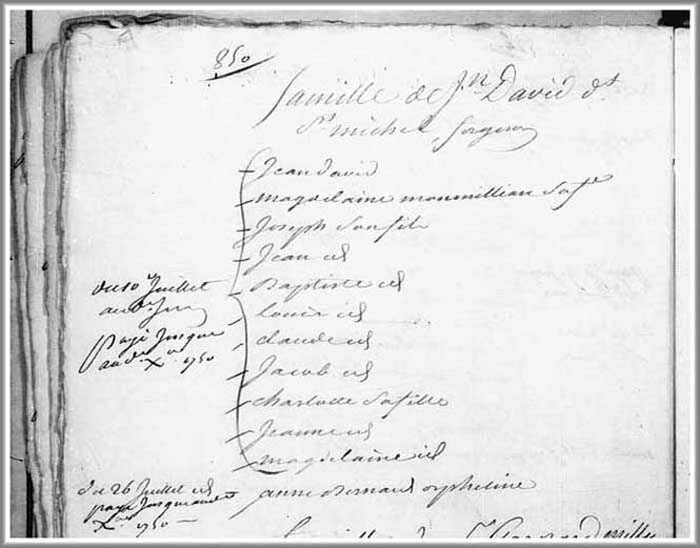 Jean Jacques' presence in Louisbourg is indirectly recorded in the Louisbourg 1724 Census which lists his father, Jean David dit Saint Michel of Nantes, a blacksmith, a wife, Marie Magdelaine Monmellian, 3 sons under 15, Pierre, Michel and Jean Jacques and 2 daughters, Magdeleine and Marie Josephe. By 1725, the family of Jean and Marie continued to prosper and grow with the birth of another son and Jean Jacques' 3rd brother, Jean Baptiste on 22 July 1725. In addition, the Louisbourg 1726 Census which also indirectly includes Jean Jacques continues to coincide with the Louisbourg 1724 Census with the addition of Jean Jacques' brother, Jean Baptiste David, to Jean Pierre and Marie Magdelaine's family in 1725. The last 5 of Jean Jacques' siblings to be born at Louisbourg were Claude Thomas born on 20 December 1735, Jacques Andre born on 30 November 1737, Jeanne Olive born on 10 July 1739, Marie Magdeleine born on 16 January 1741 and Jeanne Angelique born on 21 December 1743. After the Louisbourg 1749-1750 Census, no further record of Jean Jacques' life has yet been uncovered. 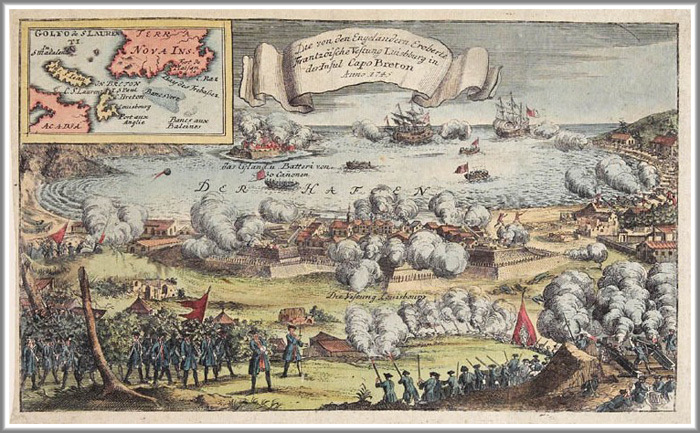 Jean Jacques' documented presence in Louisbourg is recorded in a Family Reconstitution File of his father, Jean Pierre David, which is archived at the Fortress of Louisbourg National Historic Site of Canada. This Family Reconstitution File was abstracted and compiled from original source documents archived at the Archives of Canadian and the Archives Nationale.